In The Iron Heel, Jack London warned about an all-powerful oligarchy or plutocracy. As we have seen in the century since, the real threat issues not from capitalists or corporations but from governments, who have murdered, starved, tortured, and imprisoned countless millions for ideological reasons. But even at this late date, and with evidence in abundance, there are those among us who believe that governments are essentially good and corporations essentially evil. Many of those people fantasize about corporate dystopia in the same way that preppers and Baptists fantasize about apocalypse. I suppose that's an example of the perverse human drive to fantasize about the thing you hate or fear the most, or the equally perverse wish for the world to be destroyed. Maybe the Occupy movement and people like them, existing as they do in a state of extreme boredom, comfort, and inaction, would like to test themselves against a world of corporate threats. Maybe only then might they feel fully alive and human. Anyway, I read awhile back about the Syfy network's plans to develop a television series called Incorporated. "Set in a future where companies have unlimited power," Incorporated will be a co-production of, well, three corporations: Pearl Street Productions (which is run by Matt Damon, best known as a sidekick to a Marxist marionette, and Ben Affleck, who will apologize for Islamic terrorists but not for Gigli or Pearl Harbor), CBS Television Studios, and Universal Cable Productions. Now, as we all know, people of a certain political stripe lack all sense of irony. It probably hasn't occurred to Syfy, Pearl Street Productions, CBS Television Studios, or Universal Cable Productions that they, being corporations, are making a television show about their own supposed evils. So maybe Lenin was right when he said that capitalists will sell you the rope used to hang them. A simpler way of looking at it is that the corporate dystopia is a kind of story. Corporate entertainment is in the business of telling stories. So why not? Incorporated might turn out to be thrilling and entertaining. But we probably shouldn't put any stock in the idea that corporations are going to take over the world. And if they do, they have a ready excuse, supplied by our current president. They can simply say, "We didn't build that." "Syfy Greenlights Incorporated to Pilot" by Katherine Nelson, April 6, 2015, on the website of NBC Universal MediaVillage, here. "Hey, Where's My Corporate Dystopia?" by Kevin D. Williamson, March 11, 2013, on the website of the National Review, here. "Future Dystopias Where Conservatives Have Won" by Charlie Jane Anders, September 24, 2008, on a website without a header, here. So here we are on the other end of a century that began with The Iron Heel. We don't have an Oligarchy or a Plutocracy in charge of things. On the contrary, we have a government headed by a leftist--a non-denominational leftist maybe, but a leftist nonetheless, aided and abetted by like-minded people. Some of those people came of age during the 1960s. I assume that, at the time, they stood in opposition to authority, especially governmental and academic authority. They presumably believed in human freedom. Now they find themselves on the horns of a dilemma: How can you be against power in government and academia when you're out of power, but be in favor of it when you're in power? How can you wish to assert your own freedom when you're on the outs, but once on the inside wish to compel other people to give up their freedom? The Who knew what they were talking about when they sang, "Meet the new boss/Same as the old boss." Despite labels, despite millions of words of ideology, it all comes down to the pursuit of power by men and women who are unhappy for as long as other people are free. They have a vision for the world--a utopian vision--and they will not rest for as long as the world and all of its people fall short of that vision. To them we are cattle and we must be driven, even if that means we are driven to the slaughterhouse of dystopia. A hundred years ago, Jack London feared an Oligarchy, what some people might call a Fascist, right-wing, or reactionary totalitarian state. At mid-century, George Orwell feared a Stalinist, left-wing, or collectivist totalitarian state. Many people today--in their ignorance--believe those two things to be opposites. I would ask in response: How is totalitarianism the opposite of totalitarianism? Isn't freedom in fact the opposite of totalitarianism? George Orwell's vision of the future has proved far keener than that of Jack London, but then Orwell is not so removed in the past. Many of his ideas have proved terrifyingly prescient, and his neologisms have passed into common usage: Big Brother, thoughtcrime, Thought Police, memory hole (1), doublethink, newspeak, duckspeak, Room 101. Fortunately, the dystopian future he warned against has not fully come about. It looks as though it won't, not because there are fewer totalitarians and more freedom-loving people in the world. On the contrary, totalitarians are at least as common now as they were in the twentieth century. The difference is that back then they used physical force to get what they wanted. The totalitarians of today have figured out they don't have to use torture or murder to make people comply. Instead they use their control of language and other tricks (as George Orwell foresaw) to force lies into truth and truth into lies, or crime, or an indicator of insanity. What happened this week [regarding Bruce Jenner] was a strange mix of Huxley and Orwell, Brave New World and 1984, hedonism and totalitarianism, sexual diversity and ruthless conformity in everything else--a stiletto heel stamping on a human face, forever. So if The Iron Heel hasn't come about and 1984 hasn't quite come about, then we arrive at a question: Is dystopia even possible? Or is the dystopian novel merely a kind of satire, or, alternatively, a description or diagnosis, a warning or Jeremiad? Will human beings really surrender their freedom? Will they comply with the requirements of totalitarianism? The evidence of Nazi Germany and the Soviet Union suggests that there is an irrepressible desire among us to be free. I would say that the desire for truth and freedom is innate in human beings, an unalienable part of our nature. But what if the Grand Inquisitor in The Brothers Karamazov or Yevgeny Zamyatin's Well-Doer in We or Aldous Huxley's Controller in Brave New World is right, that in order to be what they call happy, people will give up everything that makes them human? Some people would say we're living in a dystopia right now. I wouldn't argue too hard against that idea. There are certainly signs of it all around us. By the way, I just finished re-reading Brave New World. I prefer 1984, but Brave New World, with its masses of morons addled and dehumanized by drugs, hedonism, materialism, selective breeding, psychological conditioning, and mindless sloganeering, might be closer to the truth of our world today. If only they had Facebook and Starbucks their lives would be perfect. I'm still searching for the first totalitarian in literature. He isn't to be found in The Iron Heel, in which the Oligarchy is a group of men and not led by one man possessed of absolute and arbitrary power. I should point out that this whole series is predicated on the idea that utopias and dystopias--being about the future or asking the question what if?--are a kind of science fiction, hence within the realm of fantasy. I hope you're okay with that. If not, I have a table waiting for you in Room 101. Finally, what does all this have to do with Weird Tales? I'll admit that I have been writing about what I want to write about in this series instead of anything to do with "The Unique Magazine" (except for in the first part about Vennette Herron). I might be stretching things by saying all this connects somehow and eventually I'm going to make my way back to Weird Tales. Between now and then, I'm planning to write about Ben Affleck, Matt Damon, William Gibson, Hugo Gernsback, Christiana Figueres, and maybe even Rajendra Pachauri, Hillary Clinton, and two doctors, Evil and Zachary Smith. So stay tuned. (1) Ask Hillary Clinton about that one--I think her "private" computer server was manufactured by Memory Hole, Incorporated. 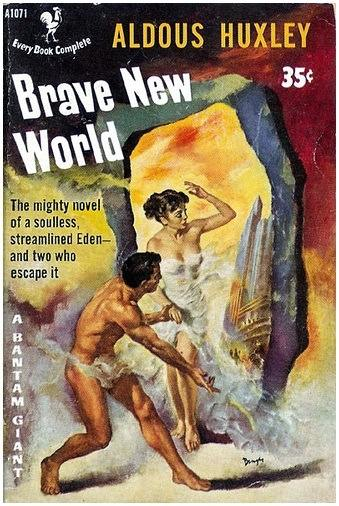 Brave New World by Aldous Huxley in the Bantam edition (1953) with cover art by Charles Binger. I don't know who are the two who escape the "soulless, streamlined Eden." Nobody escapes from dystopia. So, two families: London and Herron. Two books: The Iron Heel and 1984. Two writers: Jack London and George Orwell. George Orwell was born Eric Arthur Blair on June 25, 1903, in Motihari, Bengal Presidency, British India. (Today is the 112th anniversary of his birth. Happy Birthday, Eric!) The facts of his life are well known. Suffice it to say that he was both a man of action and a man of words, like Jack London, whom he admired and may have emulated. Orwell even wrote about London, including an essay called "Prophecies of Fascism" (1940). Although he was a socialist, Orwell authored what is probably the most scathing and penetrating critique of statism and totalitarianism in all of literature. His book, 1984, came out in 1949. Eric Blair died the following year, on January 21, 1950, in London. He was forty-six, the same age, coincidentally, as H.P. Lovecraft at his death in 1937. 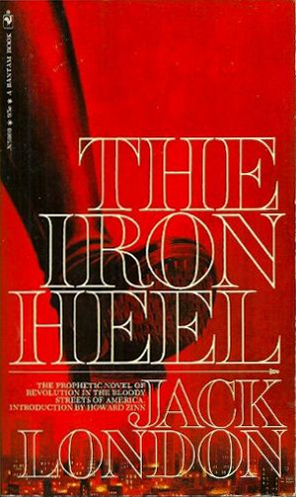 The reprinting of Jack London's The Iron Heel brings within general reach a book which has been much sought after during the years of Fascist aggression. Like others of Jack London's books it has been widely read in Germany, and it has had the reputation of being an accurate forecast of the coming of Hitler. In reality it is not that. It is merely a tale of capitalist oppression, and it was written at a time when various things that have made Fascism possible--for instance, the tremendous revival of nationalism--were not easy to foresee. It is worth comparing The Iron Heel with another imaginative novel of the future which was written somewhat earlier and to which it owes something, H. G. Wells's The Sleeper Wakes . By doing so one can see both London's limitations and also the advantage to be enjoyed in not being, like Wells, a fully civilized man. As a book, The Iron Heel is hugely inferior. It is clumsily written, it shows no grasp of scientific possibilities, and the hero is the kind of human gramophone who is now disappearing even from Socialist tracts. But because of his own streak of savagery, London could grasp something that Wells apparently could not, and that is that hedonistic societies do not endure. There are many among us who like to throw around the epithet Fascist, the way a toddler repeats a just-learned curse word. The Oligarchy in The Iron Heel has been called Fascist, as has anyone who has ever opposed the schemes of the Left. George Orwell, who ought to have known, saw that the Oligarchy in The Iron Heel is not Fascist. He didn't go into great detail as to why. I can offer a one-legged interpretation that the Oligarchy is not Fascist because it is--though statist--not socialist or nationalist. Fascism was both, as was Nazism. We should remember, after all, that Mussolini cut his teeth on socialism and that the word socialism itself is actually part of the full name of the Nazi party, Nationalsozialistische Deutsche Arbeiterpartei. 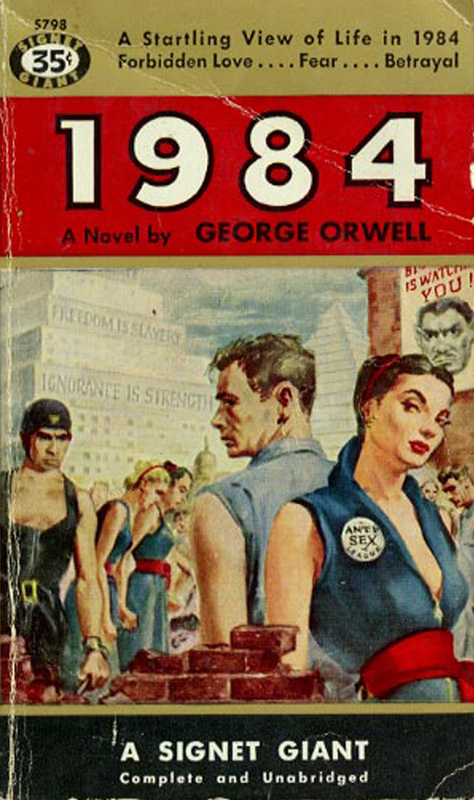 1984 by George Orwell in the 1950s Signet edition with cover art by Alan Harmon. So who is it who wishes to strip people of their liberties? To deny them a so-called "right to work"? To keep them from moving from one place to another, including out of the country, and for various reasons, not least of which is to escape onerous taxation? And who is it who wishes to deny people the right to keep and bear arms, a right guaranteed by the U.S. Constitution? You know the answer. Jack London was half right. That passage was written more than a century ago, yet it must sound startlingly familiar to current fans of fantasy and horror, for it seems a perfect description of an attack by a wave of zombies. Last year, I wrote a long series about the monster of the twenty-first century. I concluded that the zombie, as a symbol of the mob or the mass man or the dehumanized other, is that monster. The belief of the Leftist or Statist is that there is no such thing as the individual, only the masses, or at the very least that the individual is insignificant compared to the masses. Jack London seems to have known that and deserves some credit for it. So, Jack London, knowing something about power and the people who chase after power, foresaw some of the events of a century that was still young when he wrote his novel The Iron Heel. You might say that he was a visionary. His vision failed, however, when it came to the ideology or political orientation of the people he warned would seize power and establish a dystopian state. I think we can excuse that. 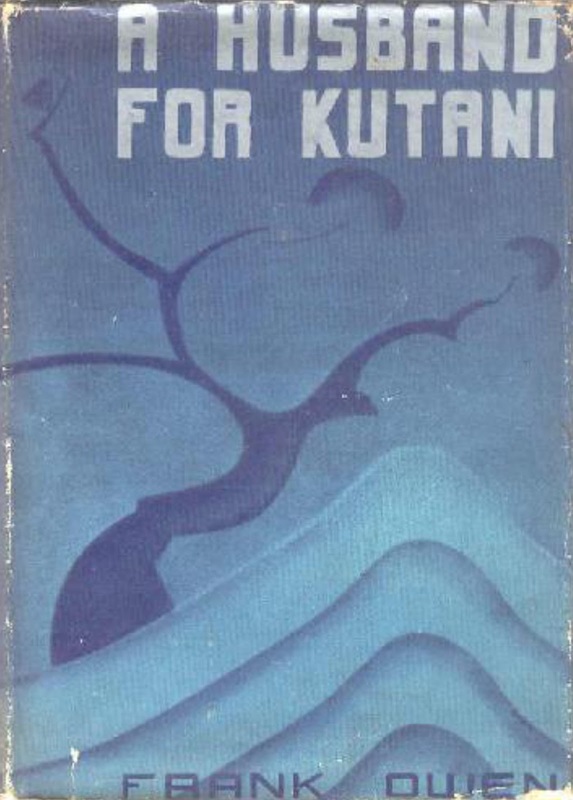 There was not yet in existence a totalitarian state when London's novel was published. He would not have borne witness to it. I believe the world, having just emerged from the nineteenth century, had not yet incubated long enough to hatch out such a creature. But in a comparatively brief period of time, the totalitarian monster matured and, burning across the world like a firebird, laid waste to half a hemisphere. George Orwell was there to witness the catastrophe and by firsthand experience wrote a more powerful book than his predecessor Jack London. The book was of course 1984. Flying saucers do not come from other planets. They come from science fiction. That's why they were first seen in the 1940s, beginning on this date in 1947, and why they were hyped by a science fiction writer and editor, Raymond A. Palmer. 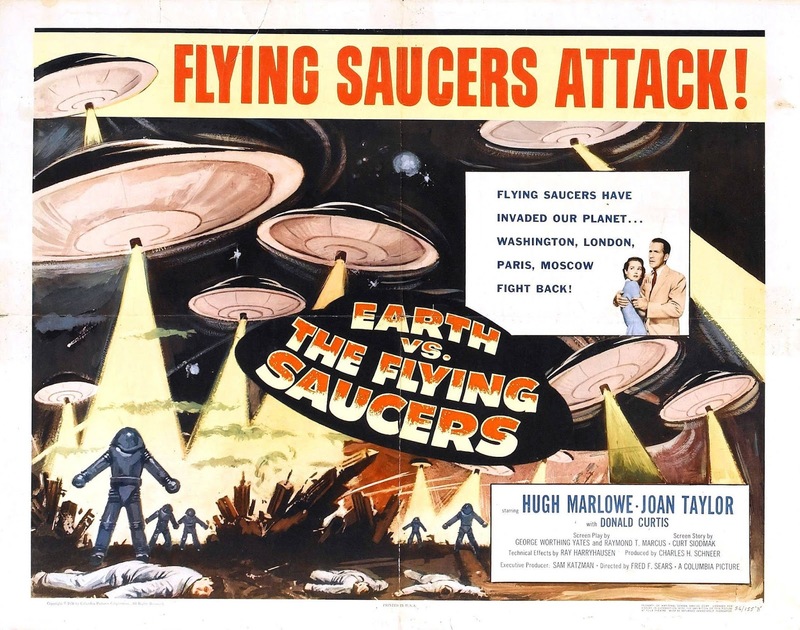 Earth vs. the Flying Saucers came out nine years and eight days later. Based on a book by former pulp-fiction author and teller of weird tales Donald E. Keyhoe, the movie was written by Curt Siodmak, who should have been in Weird Tales. Siodmak also wrote the screenplay for I Walked with a Zombie (1943), which was produced by Val Lewton, who was in Weird Tales. Anyway, Happy Birthday to the Flying Saucers! This quote is preceded and followed by illiterate Marxist claptrap, but the quote itself is illuminating, for it shines a light on the desire of the Leftist or Socialist to destroy what he hates the most, namely, the middle class, the people who by their success in life have taken away the power of the élite, of which he considers himself a part by virtue of his superior intellectual ability. And why does he hate the middle class so much? It probably goes beyond a mere gospel of envy (Churchill's phrase) and into the pathology of self-loathing diagnosed by Eric Hoffer in The True Believer: Thoughts On The Nature Of Mass Movements (1951). We should note that Marx, Engels, Lenin, Trotsky, and countless others of their kind emanated from the middle class they so wished to destroy. A point for Jack London. The bishop's crime? Giving voice to unpopular ideas. In the parlance of 1984, he has committed a thoughtcrime, and like Winston Smith, he is classed as a lunatic. So where in the United States today are the laws against thoughtcrime enforced? In the hotbeds of leftism and statism, that is, in academia, government, media, and entertainment, and probably few other places, although the Thought Police have now extended their reach into the private sector and soon into our private lives. Jack London: right in general, wrong in the specifics. Science fiction may not be about prediction, but try this on for size: In the winter of 1912, war with Germany threatens, that is, between the United States and Germany--a year and a half early for the war that really came about, five years early for war between the two nations. There's more: On December 4, 1912, a German fleet launches an attack on Honolulu, sinking four ships. Jack London got the month right and was pretty close on the day. He was also right about the place and about an attack on naval vessels. He was just twenty-nine years off on the actual date and marginally off on the attacker. In any case, you've got to give London points for those two predictions, even if they're not really pertinent to this essay. Jack London recognized the monstrousness of the totalitarian state, even at that early date. Score a point for him. A plot to explode a bomb in Congress is hatched among the oligarchs, who will blame the socialists for the attack. (pp. 171-172) Twenty years later, the Nazis hatched a similar plot with the firing of the Reichstag. London was right in predicting the ruthless machinations of statism. One of the hallmarks of a socialist or statist society is the destruction of the family, for the State cannot tolerate anything that separates the individual from itself. George Orwell foresaw it 1984, Aldous Huxley in Brave New World, and William F. Nolan and George Clayton Johnson in Logan's Run. Did any authors of the past foresee, however, that dogs would one day--meaning now--take the place of children? (2) I'm not sure that they did, just as no one seems to have predicted that the highest sexual license of the future would involve something other than heterosexuality. In any case, the wealthy woman's dog in The Iron Heel is probably not an expression of the Statist desire to destroy the family. More likely, it's an expression of the fact that when people are powerful, they are easily corrupted, a corruption that includes elevating animals to the level of human beings and/or demoting human beings to the level of animals or even of inanimate objects. The way to crush the bourgeoisie is to grind them down between the millstones of taxation and inflation. That's a good quote, and I wish it were attributable to the demonic, mummified Bolshevik himself, but alas, no. A blogger called "The Skeptical Libertarian" has puzzled it all out here. (2) It occurs to me that the craze for purebred and designer dogs may represent a kind of eugenics practiced by people who own dogs and view them as their surrogate children. Their message seems to be: better dog = better child = better parent = better dog owner. Instead of a bumper sticker that reads, "My child is an honor student at Springfield Middle School," the contemporary dog owner should have one that reads, "My dog is genetically superior to your dog (or child)." He might as well add, "My self-esteem is so fragile that my status as I perceive it is dependent upon my choice in designer dogs." The Iron Heel was published more than a century ago. By the timeline of the book, we should be about one third of the way through the reign of the Oligarchy or Plutocracy that it described. There are people today who would argue that our country has indeed become an oligarchy. I think the evidence of that is pretty weak. After all, we have a president who is, with his talk of "Wall Street fatcats" and "you didn't build that," decidedly leftist in orientation. More to the point, in the one hundred and seven years since Jack London published his novel of an oligarchical dystopia, leftists and socialists have committed atrocities that are horrifying in the extreme. Any crimes committed by capitalists pale in comparison to the tens of millions of deaths brought about by the Nazis, Fascists, Marxist-Leninists, Maoists, and other socialists of the last century. The theme: socialism as "rational" vs. freedom as "irrational." Witness the mission of the spaceship Integral from We by Yevgeny Zamyatin (1921, 1924): "You will subjugate the unknown beings on other planets, who may still be living in the primitive condition of freedom, to the beneficent yoke of reason." Since Marx or before, socialism is said to be "scientific" or "rational." Even today, those who oppose socialism are tarred with the accusation that they are anti-science. Mark one up for Jack London. London placed those words in the mouth of a capitalist, yet has Mr. Wickson's kind perpetrated crimes that are in any way equal to those of the Socialist or Statist in the last hundred years? George Orwell, in 1984 (1949), echoed Jack London's words, but he placed them at their true source: in the mouth of the Statist, in his case, the monstrous torturer O'Brien: "If you want a picture of the future, imagine a boot stamping on a human face--forever." (Signet, 1981, p. 220) Jack London: half right. Orwell, through O'Brien, paraphrases: "The Party seeks power entirely for its own sake. We are not interested in the good of others; we are interested solely in power. Not wealth or luxury or long life or happiness; only power, pure power." (p. 217) Here is Saul Alinsky, one of our president's surrogate daddies, on the same subject: "In this book we are concerned with how to create mass organizations to seize power and give it to the people . . . ." (Rules for Radicals, Vintage, 1971, p. 4) Translation: We, the Statists, will seize power, ostensibly for "the people," in the same way that the Bolsheviks seized power, and in the name of "the people," proceed to commit atrocities. Again, London was half right. Substitute leftist, statist, or totalitarian for capitalistic and you have a pretty accurate picture of what's going on in American education today. London: again half right. Typically, a dystopian novel describes a perfectly ordered society of the future. The Iron Heel (1908) is considered dystopian, but its author, Jack London, seems to have been concerned more than anything with the problems of his time. In the book, the true dystopia--complete control by the oligarchical Iron Heel--is still a thing of the future. Instead, The Iron Heel is mostly about the then-present, the recent past, and the very near future. (1) More nearly a political tract with some muckraking journalism thrown in, London's novel does not in fact fall easily into the category of dystopia. There is still opposition and violent resistance to the prevailing power. Rather than perfect order, there is still a distinctly un-dystopian disorder. The reader is left to wonder: Just what would an oligarchical dystopia look like? Is such a thing possible? I have seen this quote in a book called What Liberals Believe: Thousands of Quotes on Why America Needs to be Rescued from Greedy Corporations, Homophobes, Racists, Imperialists, Xenophobes, and Religious Extremists edited by William Martin (2008). People who call themselves liberal--today's heirs to the Progressive Era--would like to think Lewis' quote to be one of their own. It clearly isn't. The irony is lost on them. (1) Most of the action in the book takes place in the years 1912 to 1917 or so. The fictional footnotes are appended in the far future, after the Iron Heel has been overthrown and replaced with a socialist utopia. In short, we see the Iron Heel at its beginnings and look back upon it after its end, but we don't see it very well at the height of its power. (2) From God in the Dock, a reprinting of essays originally published, I believe, in 1948. The title and publication history of the essays or book are not clear to me. This is a story of two families, two writers, and two books. John Griffith Chaney was born on January 12, 1876, in San Francisco, California. The man who is believed to have been his father, William Chaney, was an attorney and a journalist. Chaney was also an astrologer. For some time in the 1870s William Chaney lived with a woman named Flora Wellman. Whether the two were married or not is a question that may never be answered. 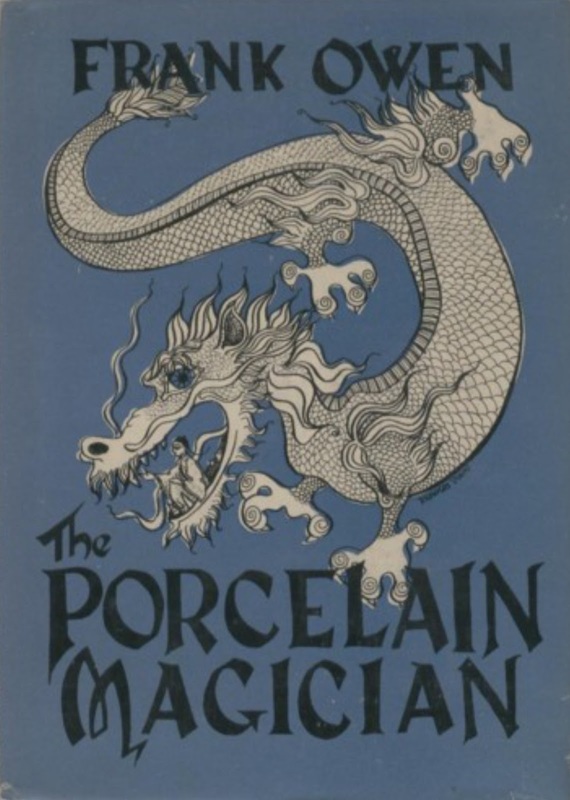 Like the supposed father of her child, Flora Wellman had skills both practical and whack-tical. In addition to teaching music, she conducted seances during which she is supposed to have channeled the spirit of Black Hawk. Chaney the astrologer and Wellman the spiritualist were a pair, but not for long. She became pregnant and announced publicly that Chaney had demanded that she have an abortion. He disclaimed parentage. She shot herself. Temporarily deranged at around the time of her son's birth, she gave him into the care of a former slave named Virginia Prentiss. Late in 1876, Flora Wellman married John London, a disabled Civil War veteran. Having earlier gained a new surname, Flora Wellman's son, the adolescent John London, began calling himself Jack. Jack London went on to become an extraordinarily prolific, active, and successful author of short stories, novels, and non-fiction. Like a fast-burning candle, he soon exhausted himself and died on November 22, 1916, at his ranch near Glen Ellen, California. He was just forty years old. You hard-shelled materialists were all balanced on the very edge of belief--of belief in almost anything. Put another way, once people stop believing in God, they are likely to believe in anything, no matter how preposterous. Or, as John Cougar Mellencamp sang, you've got to stand for something, or you'll fall for anything. Those early American Socialists and Bellamyites tended to come from religious backgrounds. Their number included George D. Herron, a Congregationalist minister and a teacher at Ripon College in Wisconsin and Grinnell College in Iowa, two schools with ties to Congregationalism and/or Presbyterianism. Herron was married three times. His first wife was Mary Vennette Everhard (1861-1935), daughter of Dr. Aaron Everhard (1824-1892) and granddaughter of John Jacob Everhard (1792-1867), a founder of Emmanuel Church in Wayne County, Ohio, and described as "rigid and uncompromising in his religious belief." (3) Mary Vennette Everhard's mother was Ann Vennette Marsh Everhard (1834-1922). The name Vennette cropped up in at least three generations of Everhard women. The youngest to bear that name was Ann's granddaughter, Margaret Vennette Herron (1885-1973), daughter of George D. Herron and Mary Vennette Everhard. 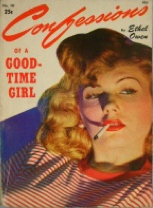 Margaret, better known by her pen name Vennette Herron, wrote a couple of collections of stories. She also contributed to Weird Tales magazine. The narrator by the way is named Avis Cunningham Everhard. Her husband, the subject of The Iron Heel, is Ernest Everhard. The temptation is to interpret that name as having some psychosexual meaning. (4) I have a better explanation. Avis' father, like Vennette Herron's father, is a college professor. Ernest Everhard also has something in common with Vennette Herron, for her mother and he share the surname Everhard. I don't think that's any coincidence at all. (1) My reason for bringing up the president isn't just as a critique. I'll have more to say later in this series. (2) The source is Authoritarian Socialism in America: Edward Bellamy and the Nationalist Movement by Arthur Lipow (Berkeley, CA: University of California Press, 1982), p. 226. Cyrus Field Willard (1858-1942) was an American socialist, Bellamyite, Theosophist, and--incongruously--inventor. Sylvester Baxter (1850-1927) was also an American, an urban planner, Bellamyite, Theosophist, and newspaperman. (3) From History of the Eberharts in Germany and the United States from A. D 1265 to A. D. 1890--625 Years by Uriah Eberhart (Donohue and Henneberry, 1891), p. 70. (4) Rather than being sexual in its overtones, the name Everhard could just be symbolic of Ernest Everhard's great strength: what better man to resist the relentless Iron Heel than a man who is ever-hard. Likewise, the given name Ernest is obviously an evocation of the adjective earnest, from my dictionary, "serious in intention, purpose, or effort; sincerely zealous." 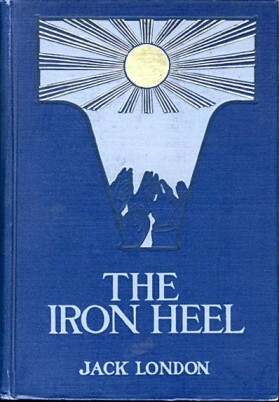 The Iron Heel in the Bantam paperback edition of 1971, with an introduction by the socialist, anarchist, and propagandist Howard Zinn (1922-2010). 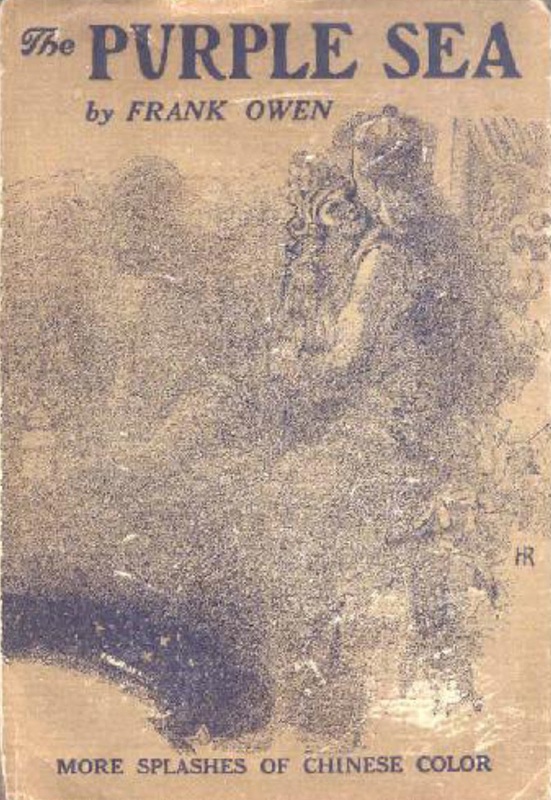 A Miss Gertrude Macaulay, possessor of a "full and well-trained contralto," received coverage in The Sketch, March 16, 1898, page 322, including a photograph showing her as a full-grown woman, perhaps in her twenties. Almost certainly the same Gertrude Macaulay, a contralto, having returned from Canada, advertised for singing engagements and to receive and visit students, giving her address as Park Court Mansions, Clapham Park, S.W., [London] in The Musical Times (Vol. 49, 1908). On July 21, 1908, a Miss Gertrude Macaulay performed at St. Nicholas Cole Abbey, 112a Queen Victoria Street, E.C., [London]. A Gertrude F. Macaulay, age 28 years, 5 months, arrived in New York aboard the Orduna on March 20, 1916, from Liverpool. Given her age and the apparent age of the previously mentioned Gertrude Macaulay, I assume that these were two different women and that the second, the passenger on the Orduna, was the writer for Weird Tales. T.B. Macaulay--Thomas Bassett Macaulay (June 6, 1860-1942)--was a Canadian actuary, philanthropist, and farmer. According to Wikipedia, "It has been estimated that most of the world's Holstein cattle descend from Macaulay's herd." Macaulay married Henrietta M.L. Bragg in 1881. She was presumably the mother of Gertrude F. Macaulay. Henrietta died in 1910. The following year, her widowed husband pushed to have Canada annex the Bahamas. A Gertrude F. Macaulay wrote a piece called "Only a 'Case'" for the journal Nurse (Vol. 5, 1916), in which she seems to have had some familiarity with nursing and hospitals in England during the war. A Gertrude F. Macaulay of Montreal was listed as a member in Journal of the American Society for Psychical Research (Vol. 12, 1918). A Gertrude F. Macaulay, presumably the same woman, wrote an article called "The Source of Inspiration" in The Editor (May 25, 1918, pp. 345+), quoting from F.H.W. Myers' Human Personality and Its Survival after Bodily Death (1903). Frederick William Henry Myers (1843-1901) was the founder of the Society for Psychical Research in 1882. June 23, 1923: A wedding announcement from the Vancouver Daily World (June 23, 1923, p. 9): "Sutton-Macaulay--Relative[s] of Miss Gertrude F. Macaulay here and in New Westminster have received the news of her marriage in Montreal to Mr. Cecil Arthur Sutton, of [illegible], England. The bride, given in marriage by her father, Mr. T.B. Macaulay, wore a French robe of ivory tinted ninon stamped with a design in velvet, enriched by a court train of net embroidered in silver, the draperies, like the veil, caught with knots [?] of orange blossom. Lilies of the valley and Ophelia roses [?] composed the bouquet she carried. 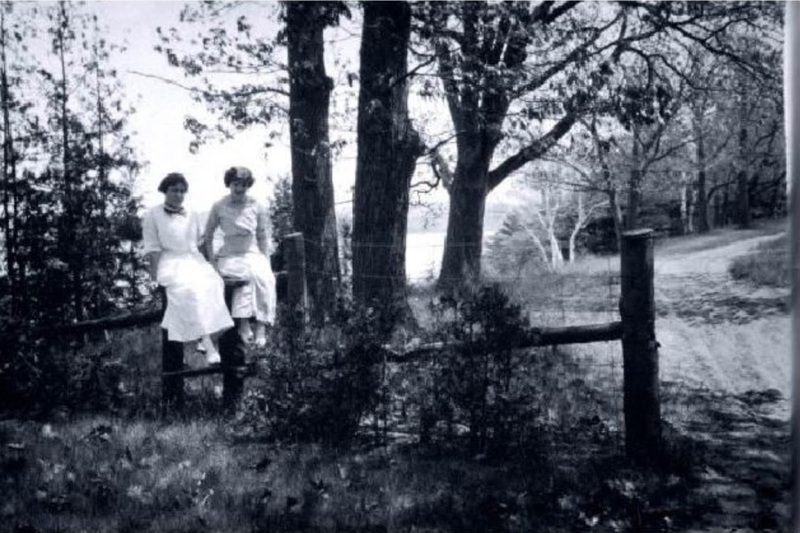 There were three attendants: the bride's cousin, Miss Edith Cuslung [? ], and her niece, Nancy Hale, and Kathryn Owen, of Detroit. All were dressed alike in almond green crepe sashed with black velvet and wore fillets of tulle. Mr. W. E. MacFarlane was best man. After a honeymoon in the Catskills, Mr. and Mrs. Sutton will live at 4002 Montrose Avenue, Montreal." In an article from the Winnipeg Tribune (Jan. 31, 1930), Gertrude MacAulay Sutton was described as "a brilliant, vivid, young Canadian writer, who has in the past two years achieved literary distinction." If she was the passenger on the Orduna, she would have been, in 1930, about forty-two years old. She also wrote for The Canadian Home Journal and The Cavalier. Her story for Weird Tales was "Gesture" from September 1930. Old St. Andrews Parish Church of Charleston, South Carolina, an Anglican church, had among its parishioners Cecil Arthur Sutton (Oct. 25, 1884-Feb. 25, 1960), “Son of William Francis and Margaret Little Sutton [and] Beloved Husband of Gertrude Macaulay.” Sutton was buried in the church cemetery. And that's all I have found. There is a good deal on the Internet about Gertrude's father, Thomas Bassett Sutton but almost nothing about her. 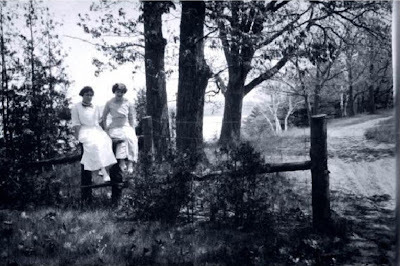 Gertrude Macaulay and friend, 1910, Mount Victoria Farm, Hudson, Quebec. I don't know which one is Gertrude. I assume she's on the left. Louis Bishop Capron was born on July 26, 1891, in the village of Menands within the town of Colonie, adjacent to Albany, New York. Capron moved to Oneonta, New York, at an early age and became interested in the history of American Indians. At Yale University he studied chemistry, anthropology, and archaeology and participated in the Yale-Andover Archaeological Survey of the Connecticut River Valley. Graduating in 1913, Capron--like his father before him--became a merchant. In 1925, he moved to West Palm Beach, Florida, where he worked for the Palm Beach Mercantile Company until his retirement in 1952. 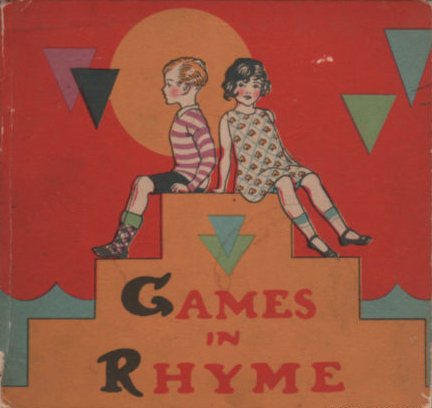 From 1915 to 1920, Louis B. Capron contributed poems, stories, and vignettes to The Argosy, Breezy Stories, Munsey's, The Saturday Evening Post, The Smart Set, and St. Nicholas. His lone contribution to Weird Tales was the short story "The Soul That Waited" from June 1925. 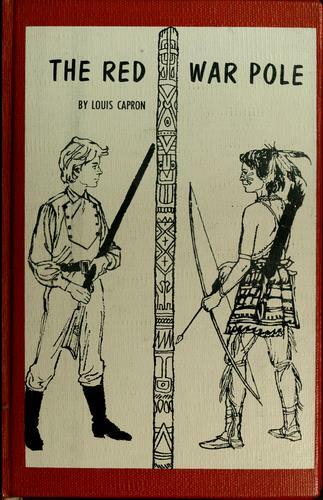 Louis B. Capron was considered an expert on the Seminole Indians and was a member of historic and anthropological societies, including the American Anthropological Association. Once in Florida, he acquainted himself with the Seminole people and wrote the text of a pamphlet, "The Medicine Bundle of the Florida Seminole and the Green Corn Dance," for the Smithsonian Institution Bureau of American Ethnography, published in 1953. His article "Florida's 'Wild' Indians: The Seminole" appeared in National Geographic in December 1956. 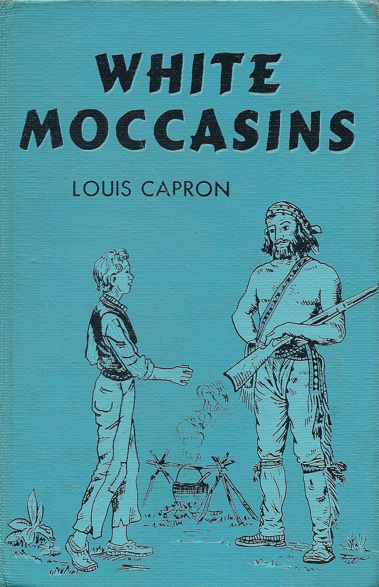 In addition to being an author of verse, short fiction, and non-fiction, Louis Capron wrote children's novels, including Golden Arrowhead (1948), White Moccasins (1955), The Blue Witch (1957), and The Red War Pole (1963). The color-coded titles remind me of those of another Florida author, John D. MacDonald. Capron died at home in West Palm Beach, Florida, on December 16, 1971, at age eighty. Louis Bishop Capron's papers are at the George A. Smathers Libraries at the University of Florida. 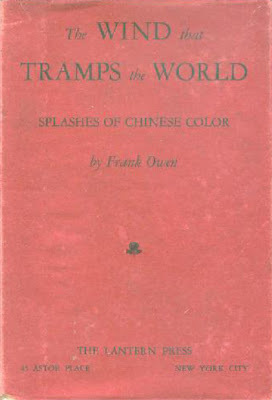 *I can't be sure that these books were by our Frank Owen, who should not be confused with the Welsh military officer, author, and newspaperman, nor with the American cartoonist (1907-1971) of the same name. OWEN, Ethel, on Sunday, Nov. 17, 1946, devoted sister of Frank Owen, Mrs. Andrew Rankine and Mrs. Paul F. Pinkham. Service at her residence, 204 Weirfield St., Brooklyn . . . . 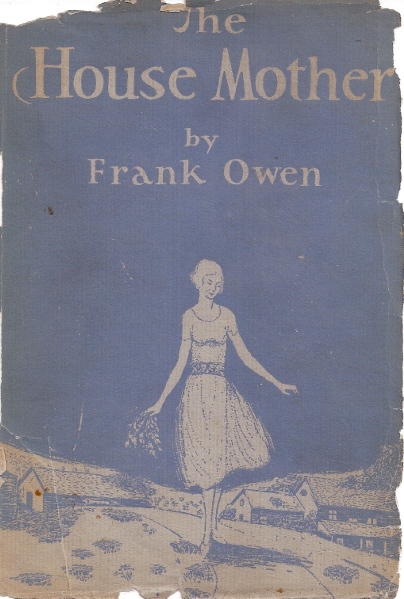 So what are we to make of the oeuvre of Frank Owen? He was a very prolific and seemingly reliable author for Weird Tales, yet his stories have very seldom been reprinted during the intervening years. It's true that they appeared in hardbound editions in the 1920s and '30s, even as most of his contemporaries were still hacking their way through the pulp jungle. But most were reprinted for the first and last time more than seventy years ago. Even if your library is well stocked, you might have a hard time coming up with even one of them. According to my recent email correspondent, E. Hoffman Price (another Orientalist) considered Owen "a fine writer," but how are we to know? 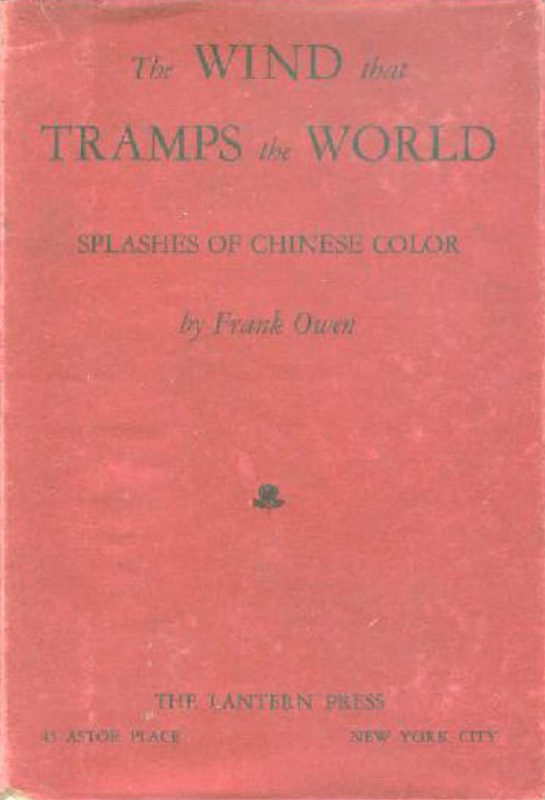 If nothing else, "The Wind That Tramps the World," Owen's most popular story for Weird Tales, should be generally available. Instead, it has been reprinted only in Weird Tales #3, edited by Lin Carter, from 1981, a book that is hard to come by. (1) Ten authors are ahead of Frank Owen in the number of stories they wrote for Weird Tales. All but Allison V. Harding have had their stories reprinted again and again. (2) Most have their own large following of diehard fans. So what of Frank Owen? Is he a neglected author? Or is there something else going on? These are no mere rhetorical questions. We should know their answer. (1) The title by the way is from the poem "Sestina of the Tramp-Royal" by Rudyard Kipling (1896). (2) Allison V. Harding is a special case. There is reason to believe that stories by that pseudonymous author received special treatment in being published in Weird Tales. Note: The illustration on the dust jacket of The Purple Sea is initialed "HR." I assume that to have been Hugh Rankin, an illustrator for Weird Tales.